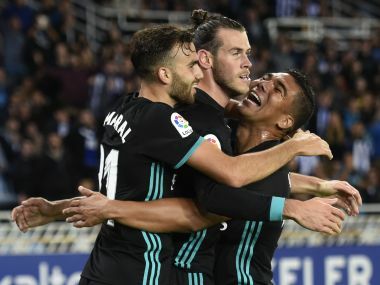 Madrid: Gareth Bale responded in style to his critics with a fine finish as Real Madrid got back to winning ways with a 3-1 win at Real Sociedad on Sunday. Borja Mayoral rewarded a bright start by Real with his first Madrid goal before Sociedad's Kevin Rodrigues scored at both ends to give the visitors a 2-1 half-time lead. Victory moves the European champions up to fourth and within four points of leaders Barcelona. Bale had received stinging criticism from the Spanish press and Madrid fans for his underwhelming displays in Ronaldo's absence in recent weeks as Real dropped points at home to Valencia and Levante. 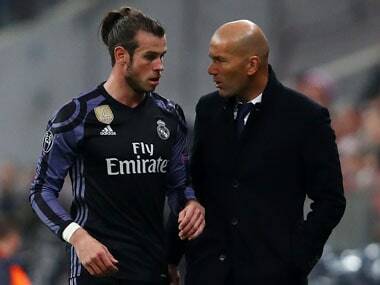 "It's great to always score, but the most important thing was to get the three points for the team, get back on track and get back to winning ways," Bale told Spanish TV station Movistar. "I just have to try to keep my head down and keep working hard and that's all I can do. "I can't control what goes on, I can only control how hard I work on the pitch. "You go through ups and downs in your career -- it is how you bounce back." 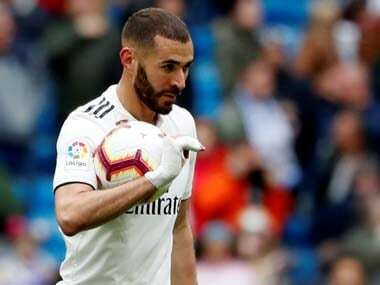 Without the suspended Cristiano Ronaldo, as he completed a five-game ban, and injured Karim Benzema, Zinedine Zidane handed 20-year-old Mayoral a shock start up front. And the Frenchman's faith was rewarded inside 20 minutes when Mayoral swept home a loose ball with a classy finish from close range. Mayoral's strike meant Madrid have now matched a world record of scoring in 73 consecutive games set by Pele's Santos in the 1960s. However, the visitors' joy lasted just nine minutes as Rodrigues levelled thanks to a blunder from Keylor Navas. Rodrigues fired Alvaro Odriozola's cross towards goal on the volley, but the Real 'keeper should have made a comfortable stop rather than letting the ball slip under his grasp. The match was then held up as a cameraman had to be stretchered off with his leg heavily strapped as he was injured from fans surging forward from a temporary stand behind the goal Sociedad were defending. The left-back was inches away from bagging a second when his looping effort came back off the bar. However, Real broke straight up the other end and the unfortunate Rodrigues turned Mayoral's cross into his own net. Bale sealed the points after the break by scoring for the fifth straight match at Anoeta as his pace took him beyond the Sociedad defence before coolly chipping over the advancing Rulli. Earlier, Alaves sacked Argentine coach Luis Zubeldia after just four games in charge as they slipped to the bottom of La Liga with a 3-0 defeat at home to Villarreal. 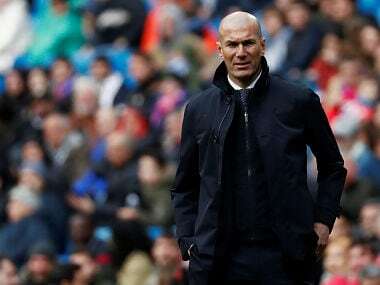 Zubeldia failed to muster a point or even a solitary goal in his brief stint in charge with defeats to Leganes, Barcelona and Celta Vigo also sealing his fate. By contrast, Sevilla's impressive start to the season continued with victory on the road at Girona to move up to second. Luis Muriel's first goal for the club since completing a 20 million euro ($24 million) move from Sampdoria was enough for a 1-0 win. And former Chelsea striker Loic Remy also bagged his first goal for Las Palmas to secure a 1-0 win over Athletic Bilbao.